What we do and how we can help your business. Attract more customers with testimonials. Aggregate, analyse, track, and publish customer feedback. Leverage your business' reputation to advertise your products and services online — it's never been this easy to attract new business! Use our industry-specific survey templates and adapt them to your needs. This way, you'll get precisely the feedback you need. With questionnaire templates, it's quick and easy. Simply select a survey topic, and you're ready to go. Modify your survey to fit the specific needs of your business and select from up 60 questions to get tailored feedback that is relevant to your customer base. Invite customers to take your surveys. Send out invitations via survey cards, QR code, paper-and-pencil surveys, email, links, social networks, the Facebook app, API interface, or personal access code. With so many options, you'll get the feedback you need in no time at all. Already have reviews listed on another platform? 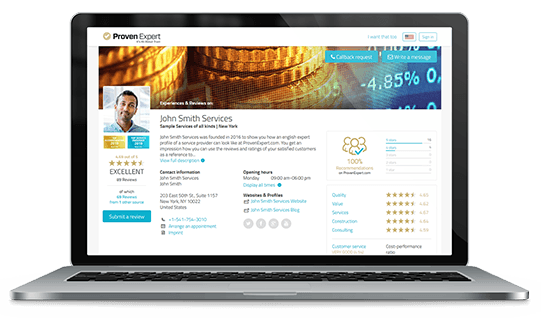 With ProvenExpert, a few clicks is all it takes to aggregate all your reviews (quantity and overall score) in one place. It saves time, lets you monitor all your reviews centrally, and keeps your company profile up to date around the clock. Survey analytics let you see just how satisfied your customers are. See all of your strengths, potential improvements, and top competencies at a glance. Optimise your product and service offerings to better suit your customer base. Tons of filters and features are available to help you quickly and easily get the information you need out of your surveys. ProvenExpert's weekly reports provide you with a summary of when and where you have received reviews, as well as all other information relevant to your business. You also have the option of receiving daily updates on all new online reviews. Put your good reputation to work for you. Publish ratings and reviews on your company profile and customise which feedback gets displayed. Tap into the power of social networks. Attract new business by advertising your customer satisfaction ratings on popular social networks. With the ProvenExpert widget for Facebook, it's easy for your followers and visitors to see how satisfied your customers are. Plus, with the Facebook survey app, you can integrate customer surveys right into your Facebook page for even faster feedback. 100% control over your reviews and ratings. You decide where, when, and what to display! One seal, every review. The ProvenExpert seal communicates a clear quality statement to potential customers. Choose from a selection of different looks and place your seal wherever you like. Five stars for your business. Promote your customer satisfaction level on Google. 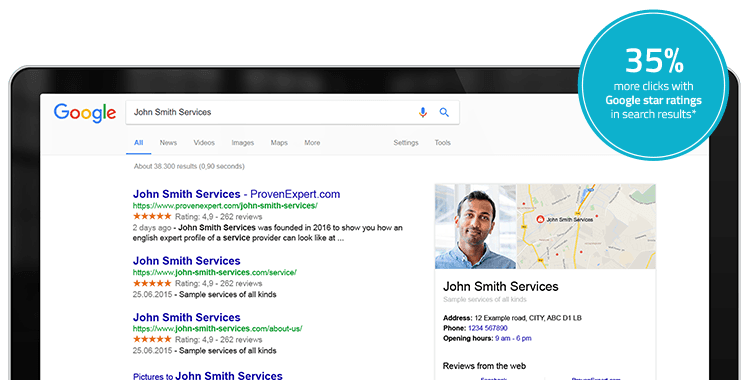 Your ProvenExpert profile comes equipped with a Google star rating, which can also be integrated into your website's search results listing for better exposure and more clicks. Publish surveys directly to your Facebook page. SEO-optimised profiles mean more online visibility for you and your business. Invite customers to take your survey via email, QR code, links, social networks, API, survey cards, and more. Feature your ratings in Google search results to attract more attention to your website. Easily connect our API to your CRM system or online shop to get even more reviews. Protection from unfair evaluations via our arbitration procedure. Quick and easy to customise for all industries and devices. Our weekly reports keep you up to date with relevant information. 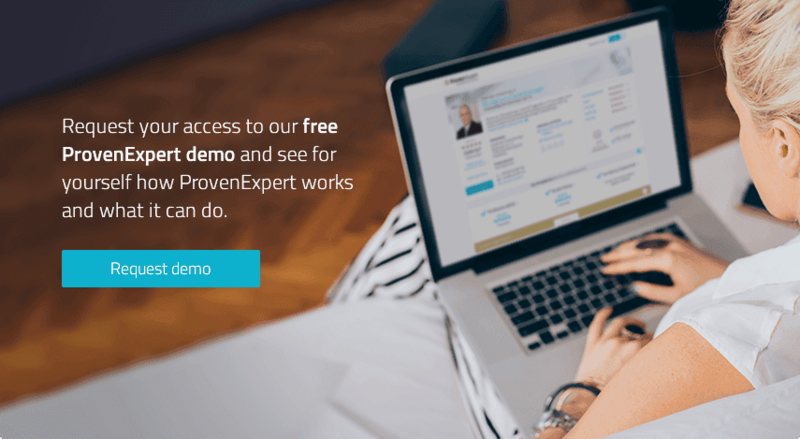 Still have questions about ProvenExpert? Simply send us an email or get in touch through Facebook, Twitter, XING, or LinkedIn. We are here for you — Monday through Friday, from 9am to 6pm (CEST).